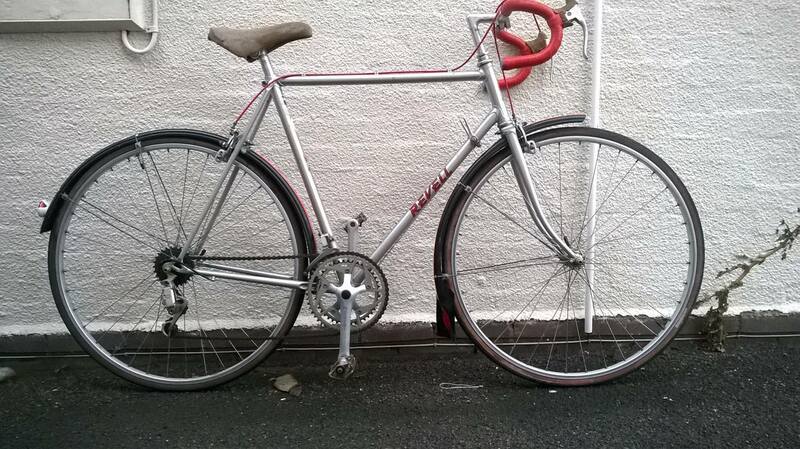 For Sale Claud Butler Strada single speed bike ideal as a commuting or general purpose road racing bike . 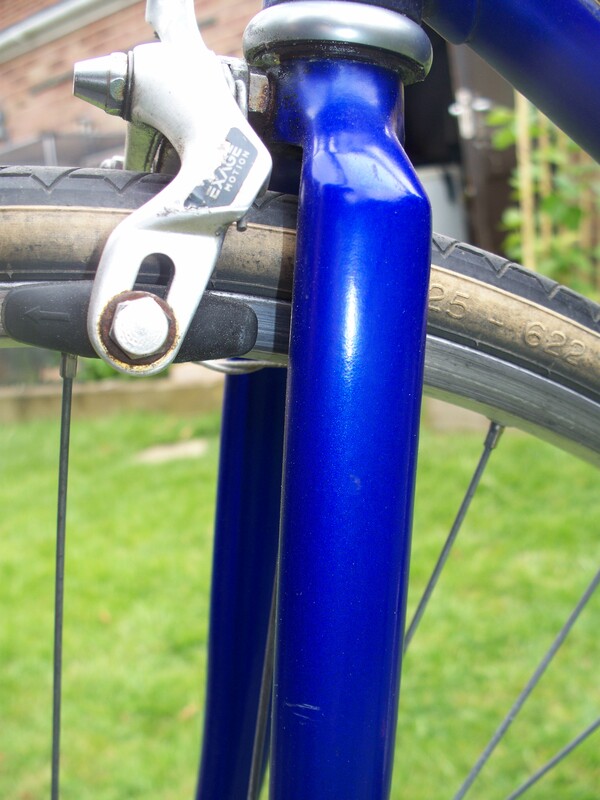 22 1/2″ or 57cm sized frame measured from centre of crank to centre of seat pinch bolt and 21 3/4″ or 55 cm along the top tube centre to centre and has a standover height of 34″ or 86.5cm . Main tubing is Reynolds cro mo double butted . All original paintwork in a nice purpley shade of blue with original decals in tact . Dates from around the mid 80’s , but just converted to single speed less than 100 miles ago by myself . 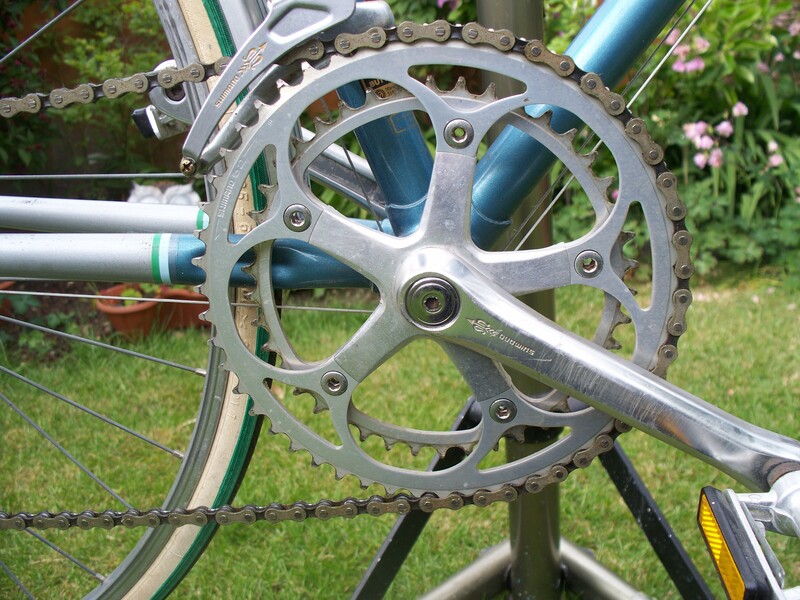 Original Sakae powering double crankset is retained and is set up on the outer 52 tooth ring whilst if you wanted you could adjust chain line and run a 42 front gear , rear is a 20 tooth gear with a spacer kit . Wheels are unmatched 700 alloy affairs , the fr being a 17 x 700 Weinmann rim laced on to a Joytech hub whilst the rear is a 19 x 700 Schurmann rim laced to Shimano freehub , fitted with a mixed used set of michelin and Hutchinson tyres . 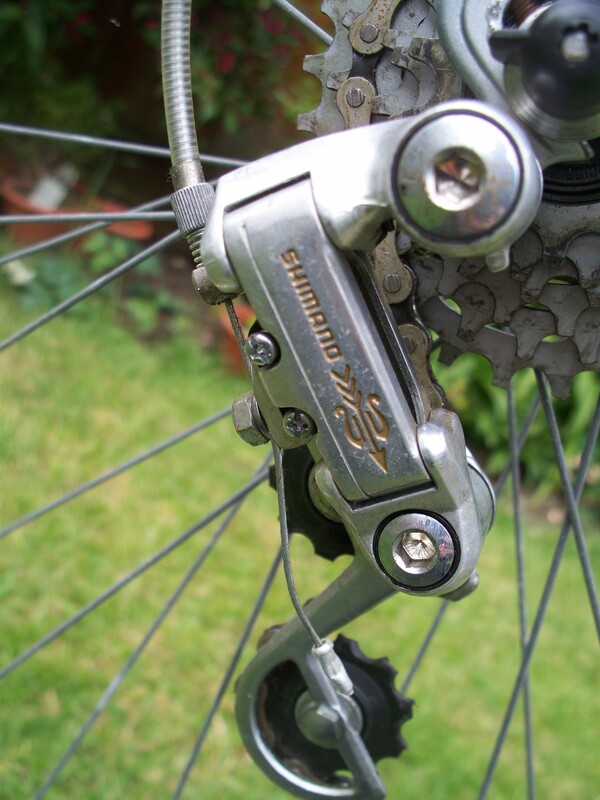 Braking is taken care of by a pr of Shimano exage calipers operated via new inner and outer cables by a pr of Shimano aero exage levers mounted on a set of Hsinlung drop bars on an 85mm custom quill stem . 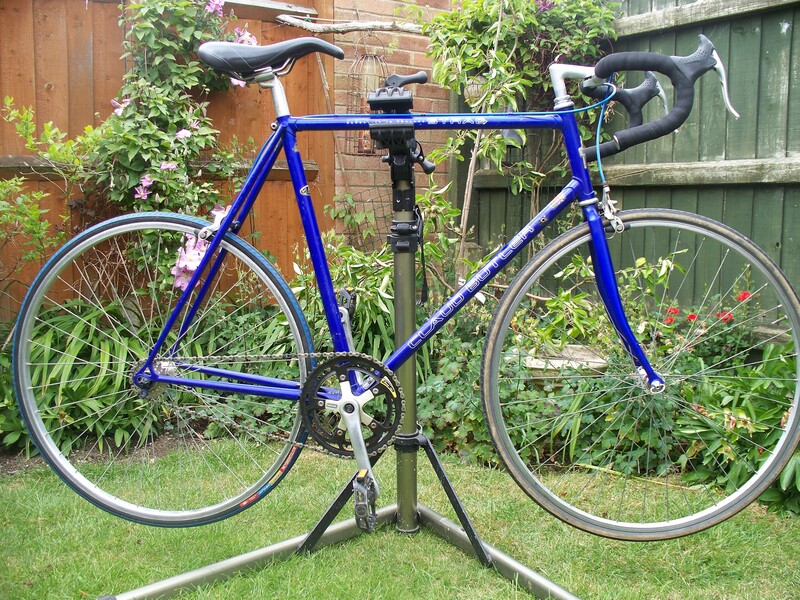 Frame has 2 sets of bottle cage mounts but no cages supplied or fitted , large black platform wellgo pedals , kalin 26.8 mm alloy micro adjust seat post with a generic black cushioned saddle (not the one shown in pictures) . New black bar tape just fitted . Tange Head set has just been cleaned and re packed with fresh grease as has the bottom bracket along with a new drive chain . Rides nice and smoothly . Well i was lucky enough to finally get my hands on not one but two Aende’s last week . 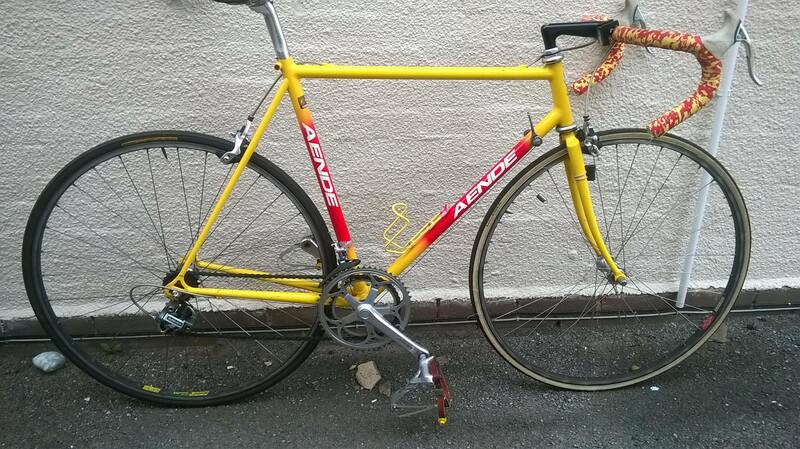 A few years ago I had a John Fearne (Leicester) road bike which was a glorious bike to ride , but I never managed to track down who made the frame , Hillary Stone thought it could have been an Aende but that was an educated guess . I have not seen many Aendes come up for sale at all over the years and the ones I have seen go for good sums of money , so never really expected to be able to own one never mind two . They both have some very nice parts on them like Campag & Shimano aero posts , Campag & Dura ace pedals , Cinelli bars and stems , Brooks Professional and Rolls saddles. So far I have covered more miles on the tourer and have found it very nice indeed to ride , but I have been itching to try the Road bike , so stripped down the very stiff and notchy Dura ace headset , and re assembled it with some fresh grease. It’s now a lot smoother but it just doesn’t feel right . I also need to either ride it with the sprint & tub wheel supplied or find a 19c Clincher tyre as a 700 x 23c tyre rubs against the underside of the front brake caliper, it’s that tight for clearance but the 2 short rides I have had on the road bike have certainly been very nice rides , I will keep you updated as time goes by . I dropped the tourer down to my local bike shop yesterday for them to do their business on the wheels and bottom bracket then I can carry on with the simpler jobs upon its return. 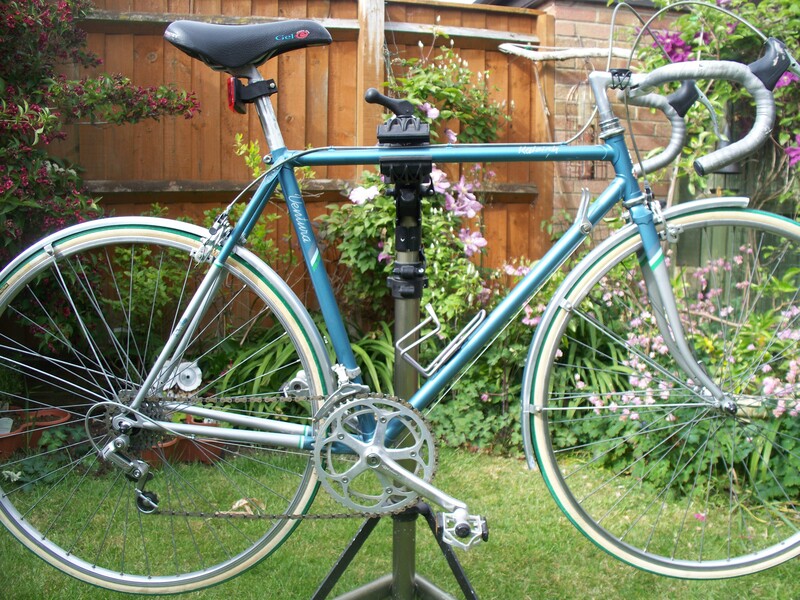 Over the last week I have spent quite a bit of time riding a Raleigh Ventura road bike from around 1987 and in all fairness to this actual machine it could quite easily have been supplied last week . When I purchased it from its previous owner I was told that his elderly brother had used the bike less than 5 times in total since the day he bought it. I took this comment with a pinch of salt but the more I look at the bike and its components I think this could almost be true . A bit of internet research led me to find a link to a copy of the 1987 sales brochure where it made me realise even more that the above statement could well be true. 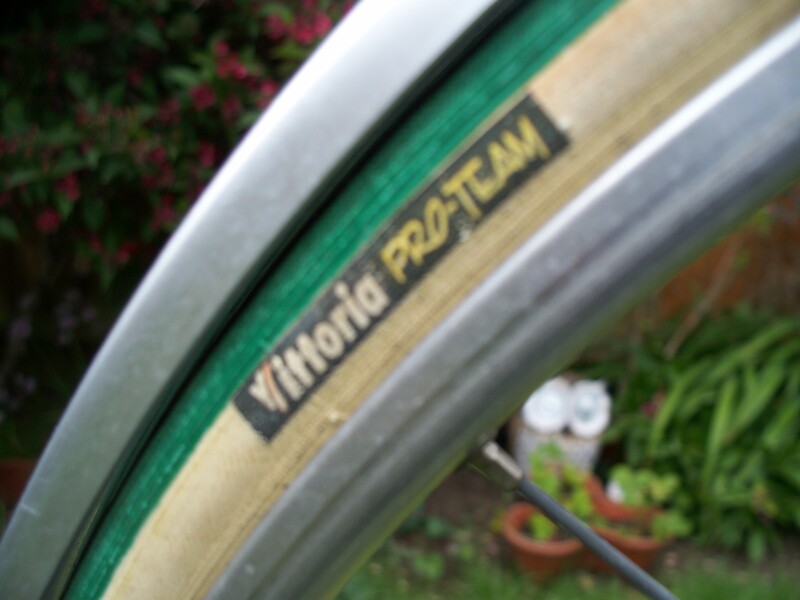 The original tyres are still fitted to the bike although I must admit I would recommend they were changed before attempting any rides of distance , for the short journeys I am using the bike for I feel quite happy to use them but if I was using the bike for longer rides then I would be replacing them asap . I was expecting them to have gone out of shape but they have not done so but the sidewalls are heavily cracked but no lifting of the tread seems to have happened . This bike has what I think is one of the nicest looking and pleasant to use Shimano “ Golden Arrow” gear system that includes the down tube levers and front and rear mechanisms that have the very nice engraved/embossed logo on them with some slight highlighting in gold as can just be seen on the pictures below. The rest of the bike is as per standard build apart from the saddle which I think has been replaced for one with a bit more padding and is actually quite comfy to ride on . Even the silver outer brake cabling is still in place although I will be replacing that soon as both brakes feel a bit stiff to operate and I feel it’s a bit of a false economy just to replace the inner cables . Wienmann 700c alloy rims are laced via galvanized spokes to the original Maillard hubs that are both date stamped 1987 as is the Custom quill stem that carries a nice set of Raleigh etched drop alloy bars and drilled non aero Wienmann levers . There are a few marks, but these were caused by poorly fitted front and rear lights and rear saddle bag support . 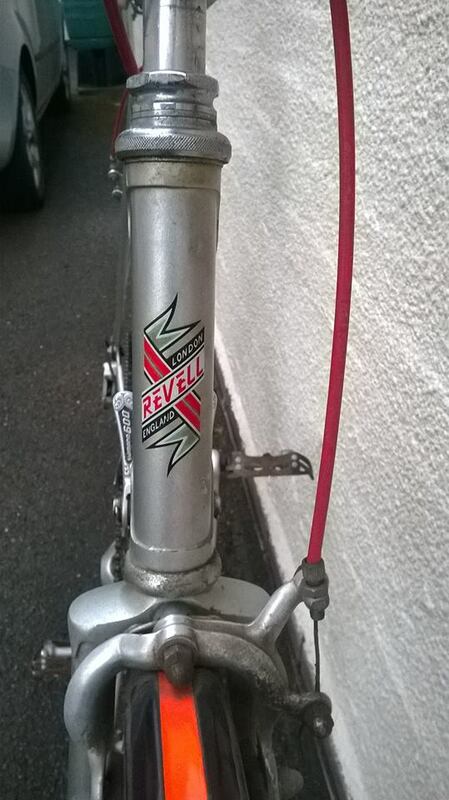 All of the original decals are there and in place including the important Reynolds 531 one . 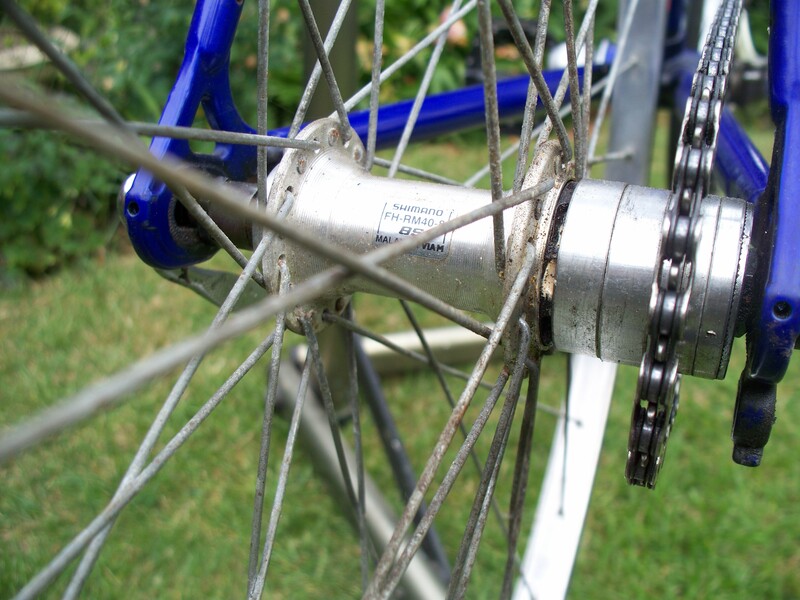 I have covered 20 miles on this bike now after my Local Bike Shop has given it a once over, applied some fresh grease to all bearings and trued up the rear wheel that had the slightest wobble on it . I doubt there are many more bikes from this era that have had such little use . 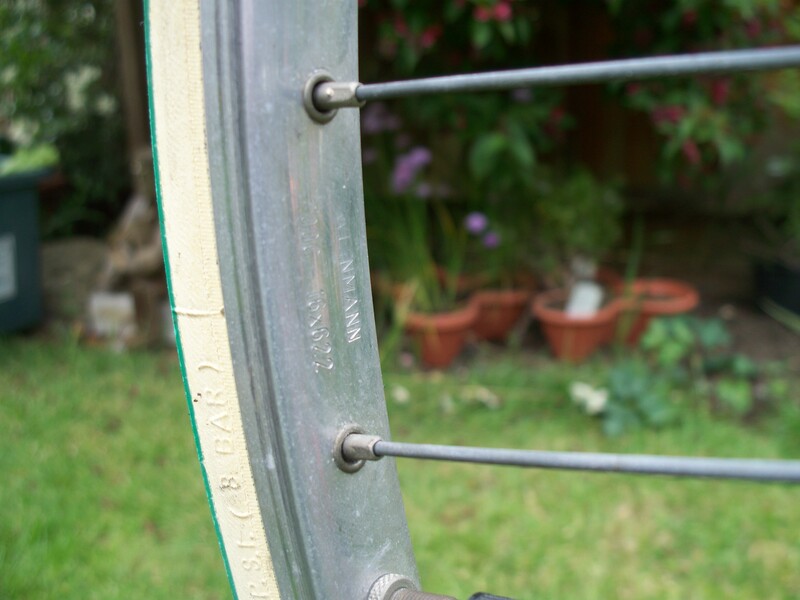 The rear stays are “ Raleigh” pantographed which I think shows that this was near to the top end of their range at time of production . Well it has been a few good years since I have had another Revell in the garage. I picked my latest one up on Monday night and I must admit I had forgotten how well they rode. 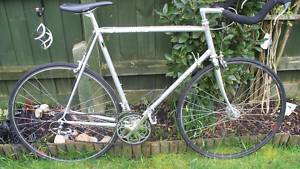 The first one I owned came from a relative who was selling his late brothers collection of road and racing bikes , as can be clearly seen from picture below it came with bull bars and from what I can remember they were very wide and when I queried it with the seller he claimed they were tandem pillion bars . 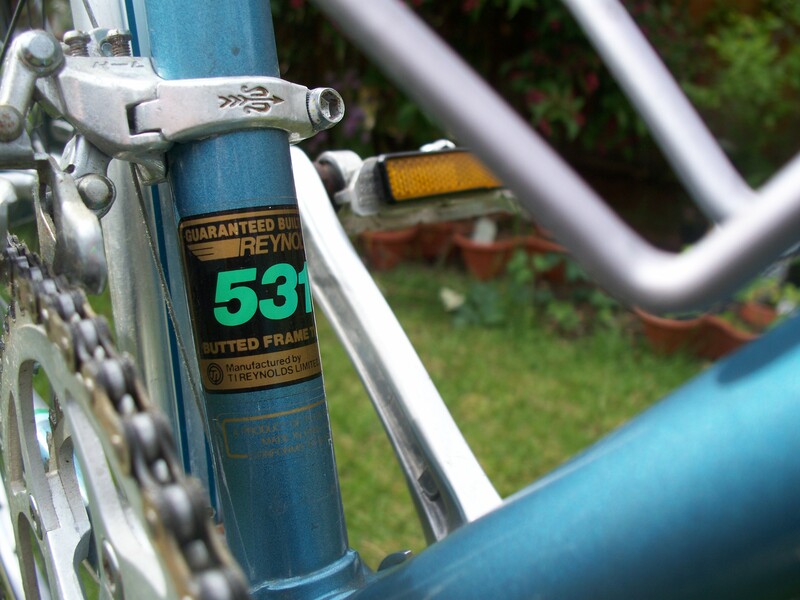 My memory is not good enough to remember much else about the bike apart from it was Reynolds 531 and it was silver in colour , not a lot to go on at all . I have watched out for other Revells since but you don’t see many come up for sale at all . My latest one is a clean example that I am guessing dates from the early to mid 80’s, not quite sure why I think that but that is my gut feeling . It is made with Ishiwata 0245 tubing and feels quite light and nimble so far. 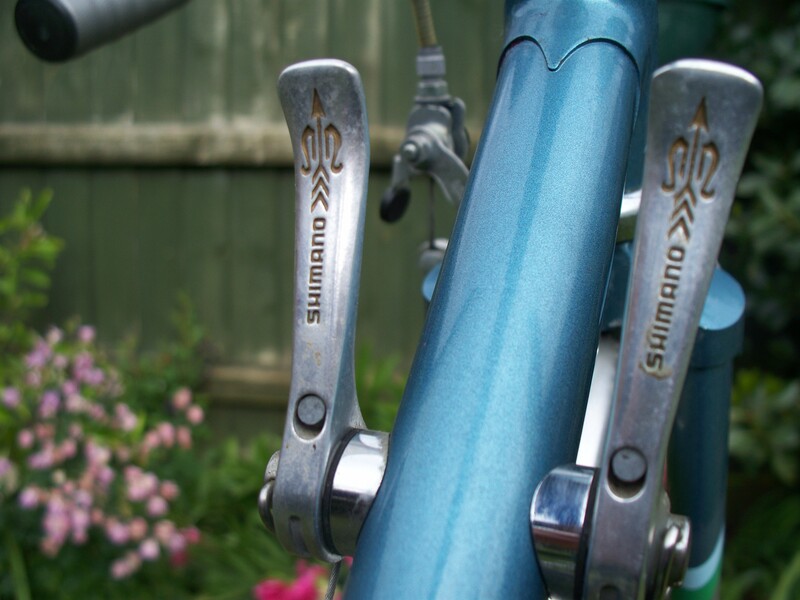 The bike seems to carry most of the original parts it was fitted with, both Campag mechanisms look to be about the right period as do the Shimano 600 engraved gear levers, the SR quill stem and Sakae bar combo with a nice pair of non aero drilled brake levers of unknown origin . 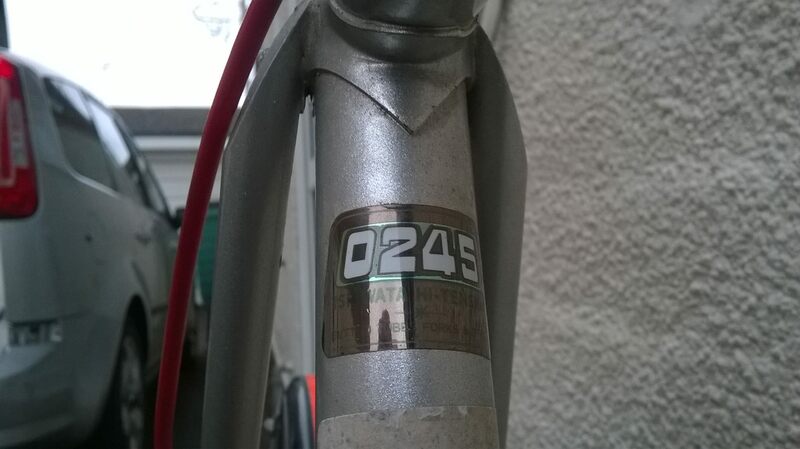 The paintwork seems to have stood the test of time very well with just a few little blemishes apparent, all decals are intact including the Ishiwata tube decal and a Dave Eldin sticker who I can only presume either sold the bike or looked after it at some point in its life . 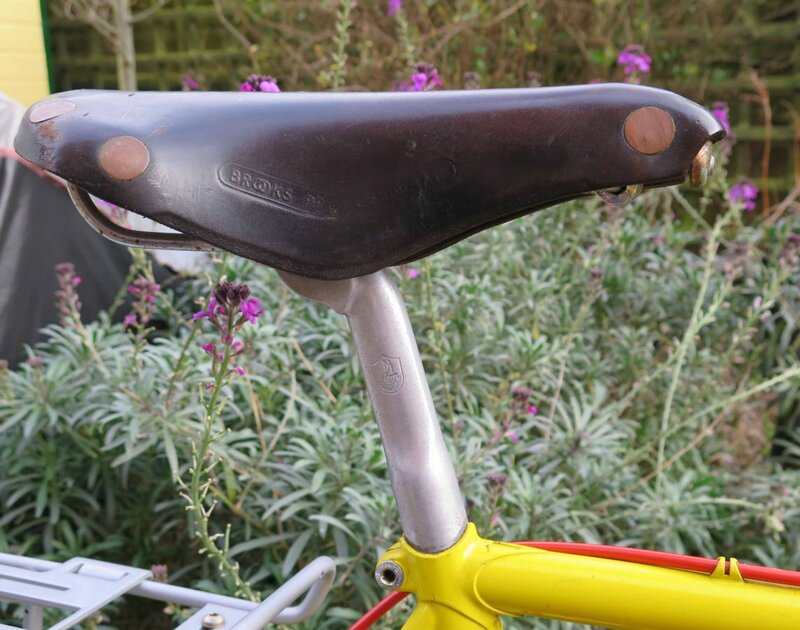 The only sign of wear is on the suede saddle but it is still a comfy item to rest your backside on , the brake lever hoods are also nice and crumbly but they are there and offer a degree of comfort when riding on the hoods . At first inspection I thought the hubs were Campag items but upon wiping the dirt and dust away what I thought was the Campag logo disappeared into the ether and no logo is apparent. Although both quick release levers seem to have the wording Ofmega hiding under the thin layer of oxidation , these hubs are laced via stainless spokes to a nice pair of Rigida 27 x 1 ¼” rims. The tyres that came with it were beyond use and have been replaced at the moment with 1 new Panaracer Pasella and 1 used tyre whilst the second new Panaracer wings its way from the online retailer . So far, apart from swapping the tyres as mentioned above, the only other work that has been done is to strip and clean the headset and rebuild with some fresh grease to make the steering a bit smoother and a quick clean of the brake caliper and front mudguard whilst the fork was separated from the frame. 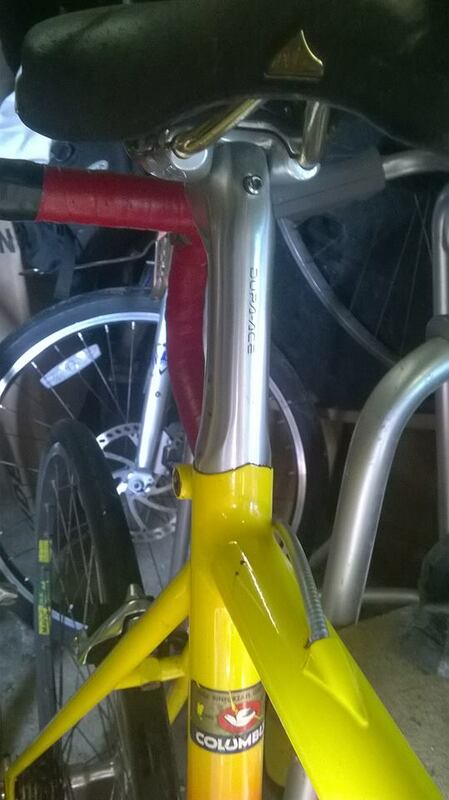 I also took the opportunity to apply some polish to the paintwork on the forks and head tube, the rest of the frame had a quick “Babywipe” down to remove the light dirt and dust layer. A better polish will follow soon on the remaining sections of the bike . 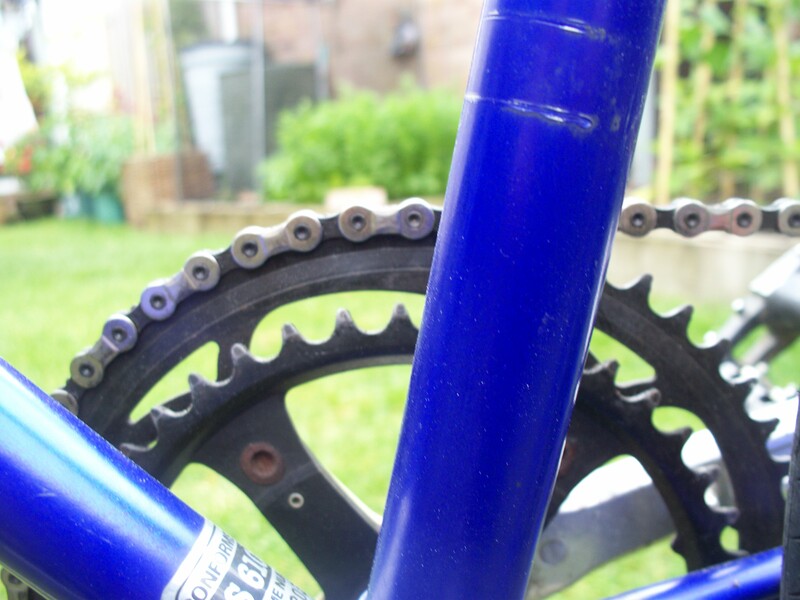 I will also be stripping and overhauling the bottom bracket although it does feel very smooth in operation but I can’t imagine some fresh grease won’t go amiss as it would in the wheel bearings too . Next job is to replace the cables although I can’t make my mind up on the red cables which seem to be in good condition . 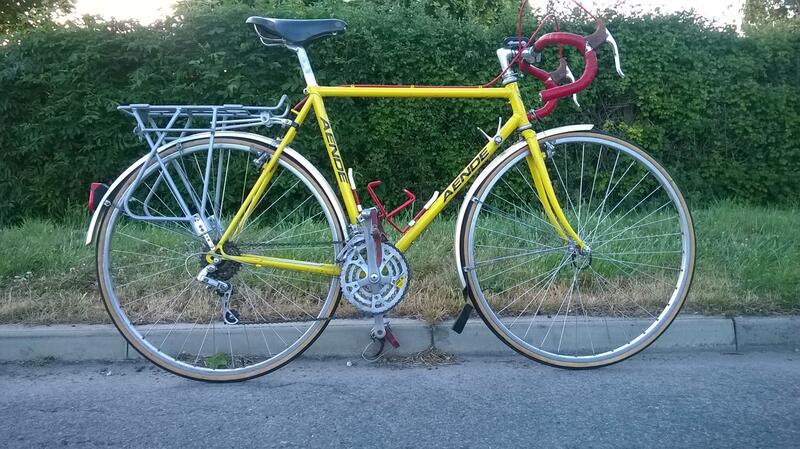 I am in two minds about swapping the 5 speed rear cog set for a more flexible 6 speed one.